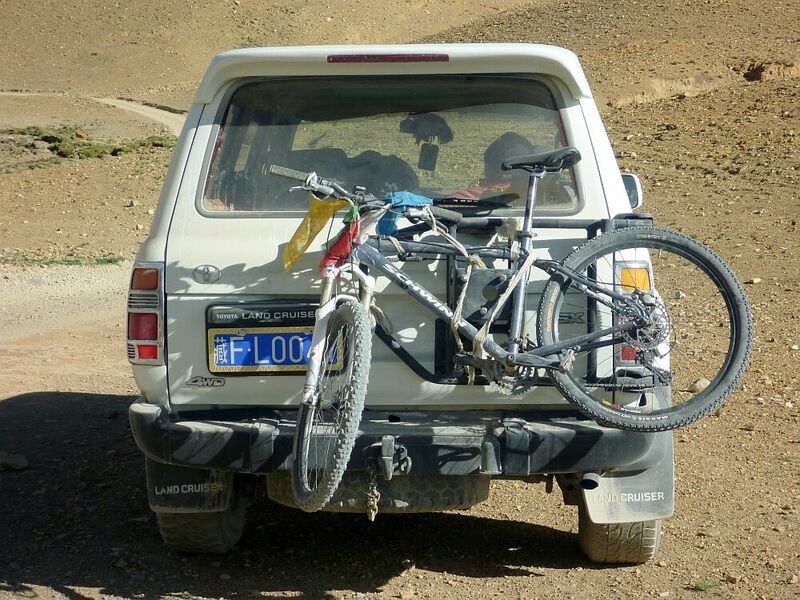 Yesterday on the way to basecamp the jockey ended up in the spokes, damaging a few spokes and bending the jockey. There were calls to remove the derailleur and make a singlespeed, but we managed to put the bike in an acceptable gear, and continued the ride with a 3-speed. This morning about 1 kay into the ride, the derailleur ended up in the spokes again, and was bent so badly that it refused to keep the chain rolling. 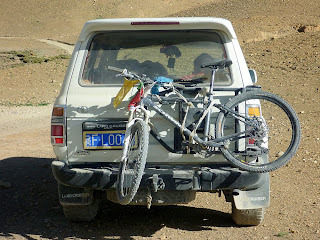 The guide offered his bike and we loaded the hardtail on the land cruiser. 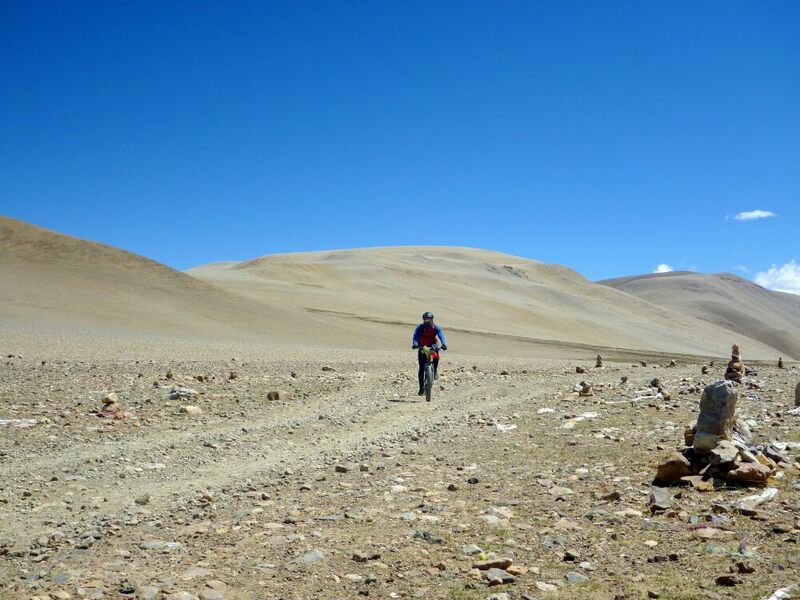 The first bit was absolutely stunning riding - it was mildly downhill, and the corrugated road caused me to continuously search for singletrack next to the road - of which there were plenty. The guide's bike's handlebars are very narrow, and the set-up feels like the bike want to go fast. It's light and handles exceptionally well. 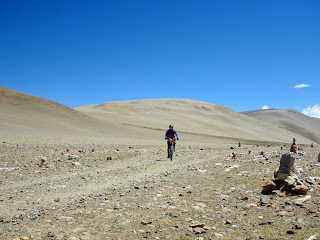 Then we started on a long uphill headwind-climb that lasted an eternity. Here's the mummy-man at the top of the climb - from here it was superb technical riding with big rocks, a river crossing, some sand and generally good desert surface. The derrailleur was bent badly, so that the top wheel-thingy de-railed the chain before it got to the bottom wheel-thingy. I removed the broken derrailleur and shortened the chain. Test it - chain climbs up to next gear (at back). Ok, lengthen chain again and put it on that cog - no luck, now it wants to climb down to the smaller one. - Any advice on how to change the bike into singlespeed without a derailleur, and get it to work without the chain wanting to go to a different gear than the selected one? I tried to select what looked like the gear that was in line with the middle blade at front, but obviously it was not in line enough. Is it even possible to make a singlespeed without using a derailleur as tensioner? - Would it have been possible to bend the derailleur back in some way, and use it as a tensioner?